Presenting some evidence that I can, in fact, set myself a series of goals and attain at least some of them: Blue Whale! 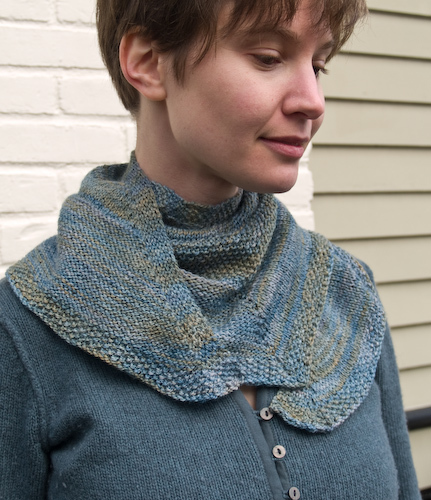 This is the yarn and Stephen West pattern that made up the first installment of A Verb for Keeping Warm’s Pro-Verbial club, and according to Stephen it will be available to the public in April. I swore to myself that if I treated myself to club membership I’d knit each skein and pattern right away, and since Installment the Second has not yet arrived I get to pat myself on the back. I also get to give a pretty, functional gift to a dear friend. I knew as soon as I saw this murky, sea-colored yarn that it would have to be for Jen, because these are her colors. 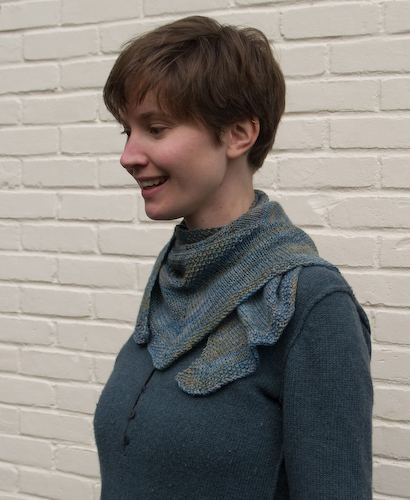 The pattern is quite straightforward except that individual row gauge, which we all know varies wildly from knitter to knitter, affects whether or not you’ll be able to work the shawl exactly as written. If you just think of it as a patchwork of stockinet, reverse stockinet, and seed stitch and work each of those patches as you know it needs to be worked, you’ll be just fine. I also suggest the use color-coded stitch markers to remind yourself where the increases go, as you probably haven’t met with a shawl exactly this shape (it has five corners). 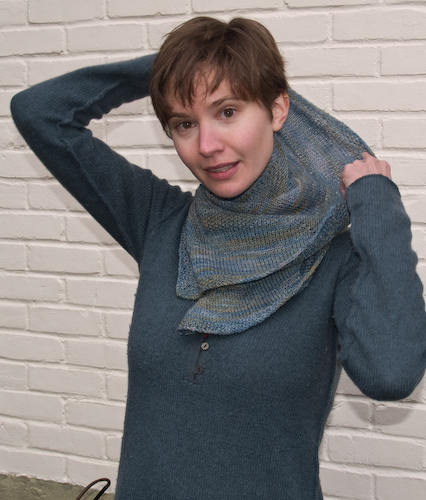 Other than that, it’s the kind of easy knitting that won’t require you to refer to the pattern very often — perfect for tired mothers trying to squeeze in a bit of handwork after the little ones are abed! I made Mr. G put it on while we did the pictures for Gridlock. At first he looked as though he doubted the manliness of a little shawl, but half an hour later I found he was still wearing it. If he mends his ways in the department of Keeping Track of Things Your Loving Wife Has Lovingly Slaved Over, I may even make him one of his own. Beautiful! I’m so proud of you for meeting your goal, and also proud of Mr. G for branching out! such a pretty scarf!! that yarn is incredible, and the colours look great on you. There are definitely some lovely man-shawls out there, and I bet he realized how awesomely warm they can be. This is beautiful. Way to go, little mamma. What a lovely scarf! Those colors are so perfect on you. That is a beautiful scarf/shawl. I have been really tempted by Stephen West’s patterns for a while, but haven’t chosen one to start. Have you made any of his other patterns?